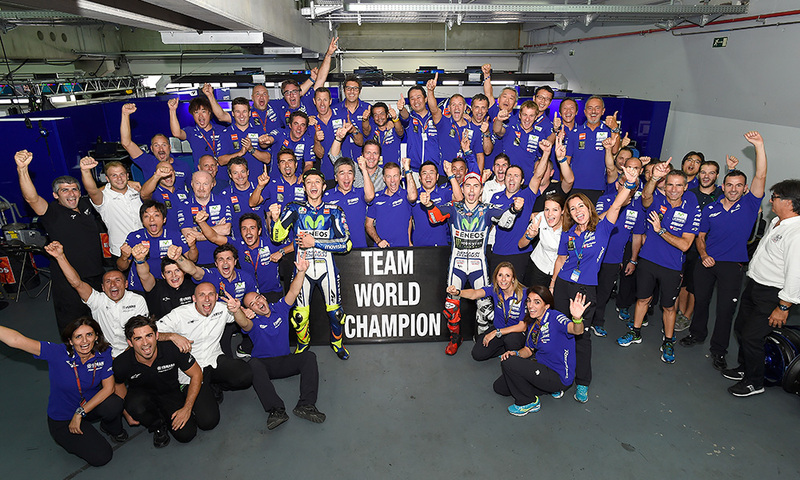 Road Racing World Championship > MotoGP | 2015 YAMAHA RACING SEASON REVIEW | YAMAHA MOTOR CO., LTD.
Yamaha Secures 5th MotoGP Triple Crown! 2015 was a crucial year for Yamaha, marking not only the company's 60th anniversary but also its 60th year in motorcycle racing. The Movistar Yamaha MotoGP factory team consisted of Valentino Rossi, the championship runner-up of the previous year, and Jorge Lorenzo, who had finished the 2014 season in 3rd. Pol Espargaró, who ended his last season in 6th, and Bradley Smith, who was ranked 8th in 2014, made up the Monster Yamaha Tech 3 satellite team. They would all be riding the six-time championship-winning YZR-M1 machine. Lorenzo was aiming for his third title in the premier class while 36-year-old Valentino Rossi was fired up about the prospect of taking his 10th career world title after a six-year drought. A tremendous amount of work was being done on the development side as well, with Yamaha engineers devoting themselves to building a machine that could bring the title back to Yamaha for the first time in three years since Lorenzo won it in 2012. Following the positive pre-season tests, at the first GP of the season in Qatar, Rossi and Lorenzo took to the track where they battled for position with the Ducatis. Rossi thoroughly enjoyed the fight, saying, “It was definitely one of the best races of my career.” In the closing stages he had calmly read the playing field and chosen his plan of attack against Ducati's Andrea Dovizioso, engaging his fellow Italian in a closely-contested final few laps that went down to the very last corner before Rossi emerged victorious. The opening race had proved to be a fantastic start to the season. Having gained momentum after his initial win, Rossi followed it up by finishing 3rd at Round 2 in the United States and winning Round 3 in Argentina, his second of the season. That placed him comfortably at the top of the championship standings after three rounds. His teammate Lorenzo did not have such an easy start, but was back on form as the series came to the European circuits. He took a pole-to-finish victory at Round 4 at Jerez, then went on to win in France, Italy and Catalunya, completing a career-first four-race winning streak. Meanwhile, Rossi had never finished off the podium and still led the championship, but Lorenzo had begun to chip away at his points lead. That lead was reduced to just a single point by Round 8 in the Netherlands. By that time, Ducati's Andrea Iannone was 3rd in the standings, but behind by more than 40 points; the contenders for the title had already been largely narrowed down to the two factory Yamaha riders. Rossi took his first pole position of 2015 at the Assen TT before putting on one of his best performances of the season. Rossi spent his opening laps holding off Honda's Marc Marquez while building a gap to other would-be pursuers. As the race neared its end, the two were engaged in a breathtaking back-and-forth duel. With three laps remaining, Rossi opened up a small gap by putting in his best-ever lap of the circuit, but halfway through the final lap, Marquez had closed it with some incredible riding. The battle came down to the final chicane and the two bikes came into contact. Rossi was pushed wide into the gravel, but amazingly managed to pull the bike upright, plow through the gravel trap and return to the track in front of Marquez and take the checkers in 1st. Lorenzo completed the podium in 3rd behind 2nd-placed Marquez. Following that though, the Hondas of Marc Marquez and Dani Pedrosa got involved in the next few races, subtly influencing an already fierce battle for the title. At Round 11 in the Czech Republic, Lorenzo took his fifth victory, which made him level on points at 211 with 3rd-place finisher Rossi and brought the contest back to its starting point. At Round 12 in the United Kingdom, the race was shortened to 20 laps just before the start due to rain, but Rossi held on and notched his 4th win of the season. Lorenzo finished in 4th due to an issue with his helmet's visor. At Round 13 in San Marino, the weather once again played a major role as Lorenzo crashed out after his second bike swap. Rossi was also off the podium for the first time in the season, but carved out a 23-point advantage over Lorenzo with his 5th place finish. “Two races with bad luck in a row, because the circumstances were wet and abnormal. [...] If I win all the coming races I can still become the World Champion and it wouldn't matter what position Valentino would finish in,” said Lorenzo, reassuring himself that the title was within reach. Then at the 14th race of the season in Aragon, Lorenzo took the win and Rossi finished 3rd. At this point, the Movistar Yamaha MotoGP team had already secured the 2015 Team title. The next round in Japan saw Rossi finish 2nd and Lorenzo 3rd, putting 18 points between the two Yamaha men and officially making them the only two riders with a possibility of taking The 2015 World Championship title. The 16th round in Australia was host to an incredible all-out dogfight among four riders, with Marc Marquez's Honda and Andrea Iannone's Ducati getting into the mix with the Yamahas. Slicing and dicing for the lead, the race-long skirmish went down to the final lap. Lorenzo took the checkers in 2nd and Rossi finished in 4th position. There were then only two rounds remaining: the Malaysia GP and the season finale in Valencia. However, the championship fight took an unexpected turn in Sepang, Malaysia. Lorenzo got slightly pushed down the order on the first lap but soon recovered to pass Rossi and Marquez before starting his pursuit of Dani Pedrosa and eventually finishing 2nd. Rossi was left to battle Marquez for 3rd. The two had an intense skirmish before lap 7, when it appeared that the two made contact and Marquez crashed while Rossi continued his race to finish in 3rd. Rossi was penalized for the events at the Malaysia GP and was forced to start from the back of the grid at the final round in Valencia. Rossi had only a 7-point lead; Lorenzo had finally closed in on achieving his goal. At the long-awaited final round, Lorenzo got a dream start to his attempt at a come-from-behind championship victory by not only starting from pole position but also taking the holeshot into the first corner. With Marquez and Pedrosa close behind, Lorenzo clicked off smooth, fast laps at the front. Meanwhile, Rossi put all his skill to work as he pushed to catch the leaders, jumping from 26th to 15th on the opening lap. He had climbed to 9th by lap 3 and 4th by lap 13. Rossi saw the title that was once within his grasp slip away. “We built this season from the first race and it was a great season, I was always competitive and I never made any mistakes. I thought after Motegi that I had the potential to win the championship, but unfortunately from the race at Phillip Island something changed,” was his frustrated take on the season. Monster Yamaha Tech 3 rider Bradley Smith had a great year in 2015. Among his highlights were a season-best result of 2nd at a very wet race in San Marino and finishing all 18 races of the season inside the top eight. He captured a personal best of 181 points for the season, putting him in 6th in the rankings and making him the year's top satellite rider. Smith's teammate Pol Espargaró finished in 9th overall, taking 114 points for the season and notching up top-five finishes in Jerez, the Netherlands and Valencia. Though they were up against several full factory efforts, the Monster Yamaha Tech 3 pair's hard work achieved an overall ranking of 4th for the team. Having already taken the Constructor title at Round 16, Yamaha capped off its 60th anniversary year by winning its fifth MotoGP Triple Crown.